It is that time of the year, once again, for me to share with you my Top Twelve Photographs of the Year 2018. This is the 6th edition of a tradition that began in 2013, inspired by Ansel Adams’ quote above. Ansel Easton Adams (February 20, 1902 – April 22, 1984), is one of the most recognizable names in American landscape photography. His black-and-white landscape photographs of the American West, especially Yosemite National Park, have been widely reproduced on calendars, posters, books and prints. 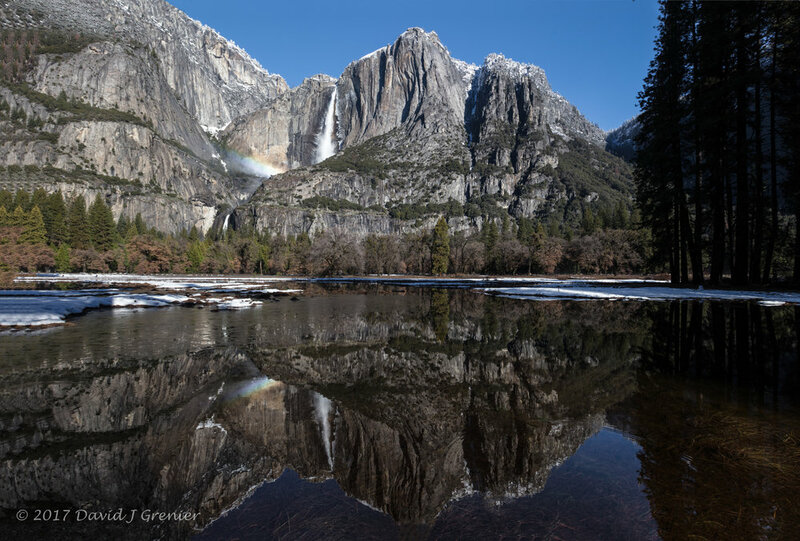 He is revered by landscape photographers all over the world, and to this day his extended family continues to own and operate The Ansel Adams Gallery in Yosemite National Park. 2018 was a unique, outstanding and productive year. There were several milestones: a photographic journey to Yellowstone National Park in the winter, my first visit to India including shooting the magnificent and uniquely colorful Holi Festival, an opportunity to shoot the lava flows on the Big Island this year, as well as my first visit to the Canadian Rockies. 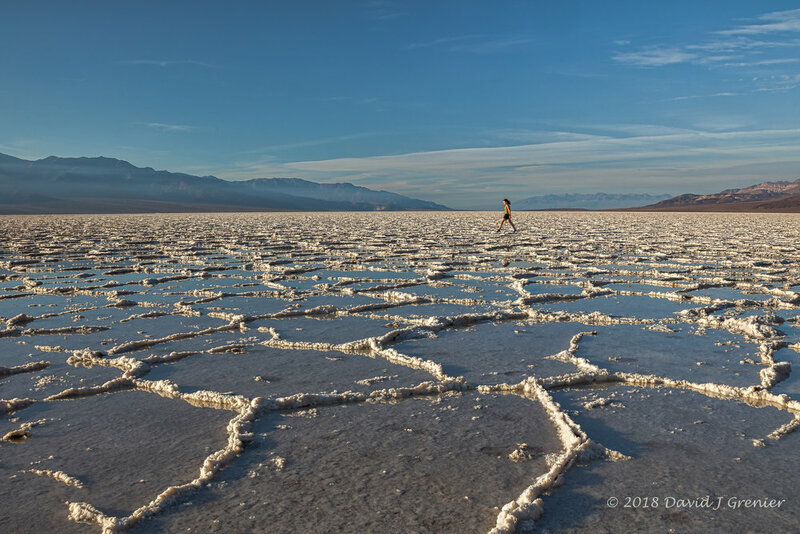 In all, a rundown of all the locations photographed in 2018: Yosemite National Park (4), Yellowstone National Park, Death Valley National Park, Big Sur Coastline (2), Mt. Shasta, Big Island Hawaii, Kauai (2), and my first trip to India. When you shoot a few thousand images, as I do on an annual basis, it is difficult to cull it all down to ‘twelve significant photographs.’ So, as in previous years, I determine my Top Twelve, and the order of the selections, by the amount of response the images received on social media. Again this year I will count them down starting with Number 12, its title, some background about each image, and some basic EXIF data. #12. Here Comes the Sun – I have wanted to photograph in the Canadian Rockies for some time. When the opportunity arose I was able to be joined by two of my favorite photog compadres, Eric Emerson and Michael Heathman, and so this bucket list item was finally accomplished. This particular location is Moraine Lake, a glacially fed lake in Banff National Park, 9 miles outside the Village of Lake Louise, Alberta, Canada. It is situated in the Valley of the Ten Peaks, at an elevation of approximately 6,183 feet. The Tower of Babel is this quartzite spire rising 1,476 feet above the North end of Moraine Lake, with the summit reaching a height of 7,743 feet. We were incredibly lucky to be given beautiful morning light, an unseasonal dusting of snow, and these magnificent reflections in the lake. #11. Star of India – On our last evening in Agra, we shot the sunset from this location with the Taj Mahal in the background. This location, not accessible to most other tourists, we were brought to by our excellent tour guide, Harsh Agarwal. He also brought his sister-in-law, who made this shot very special. After all, it was originally built for a princess! I feel obligated to write a seperate blog post about my India adventures, a truly magnificent magical mystery tour! The tour of India was organised by Ken Lee, and I would highly recommend you check out his web page for a trip to India, as well as other several other unusual and exciting locations. #10. 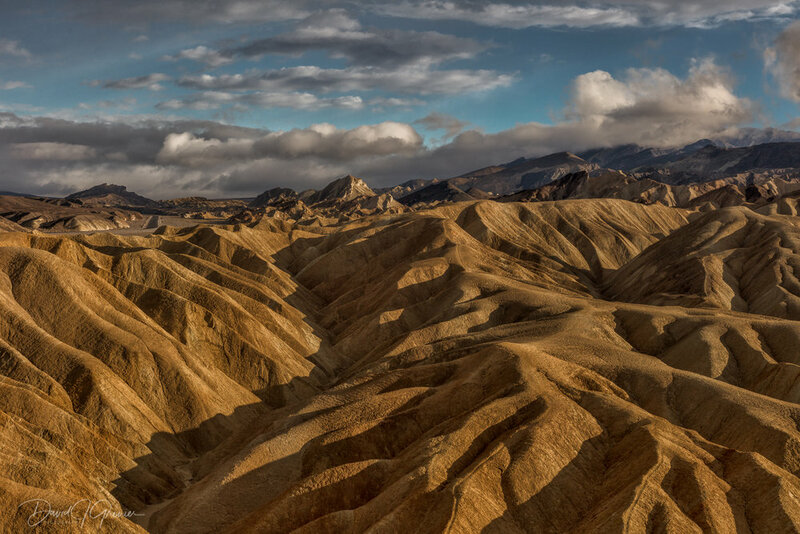 Designs by Sandstone – These eroded sandstone ridges near Zabriskie Point, Death Valley National Park, California, have always caught my eye. This image from a late afternoon shoot in early January, 2018, I did not develop until I ‘accidentally’ found many months later. This is why I have a hard time cleaning out my files until many, many months have gone by after the initial shoot. I did write a blog earlier this year about this remarkable journey. #8. On The Edge – A sunset at ‘my oak tree’ 10 minutes from my home, that highlighted the smoke that enveloped this area due to the worst forest fires in the history of the state of California. 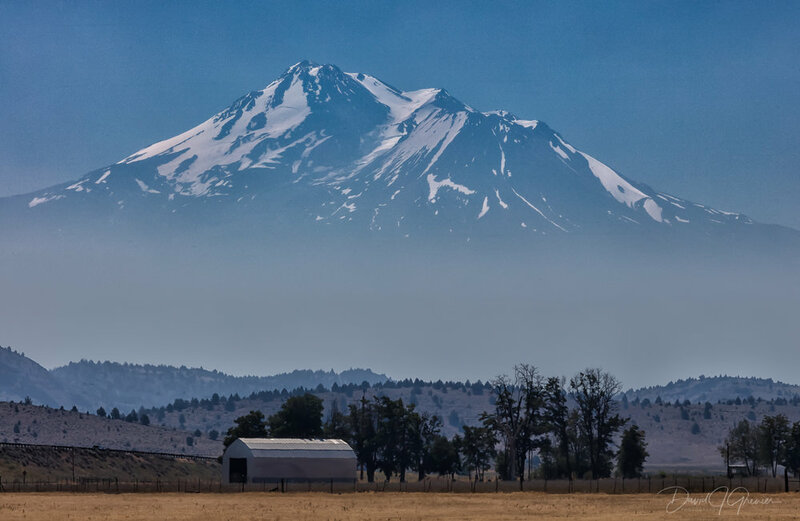 When I shot this image there were 16 major fires actively burning in the State. To the south of this location, the Ferguson Fire prompted Yosemite National Park officials to close the popular Yosemite Valley for the first time in 20 years, during the peak tourism season. We are all hoping for a return to normal winter conditions and look forward to some heavy snowfall and rain in the next 4 or 5 upcoming months! The color of the setting sun was created by the low lying smoke from all of the State’s ongoing fires. #7. 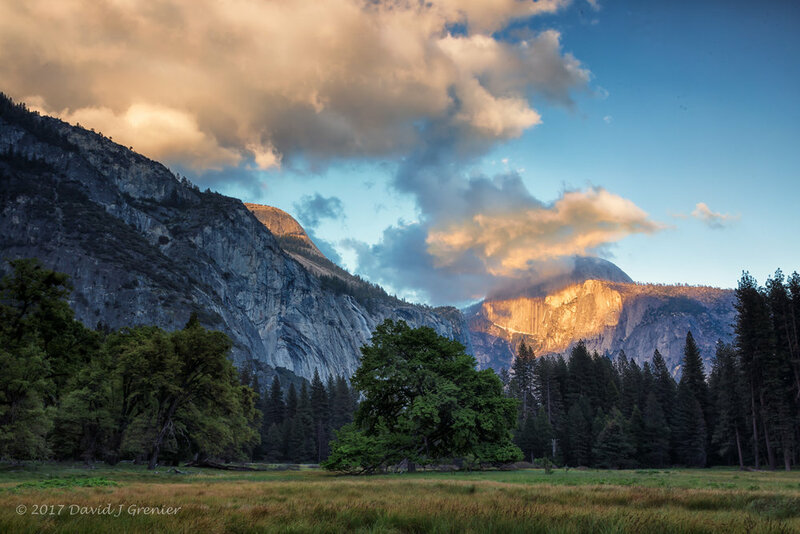 Joy – This is what I feel when I arrive to photograph this location in Yosemite National Park. 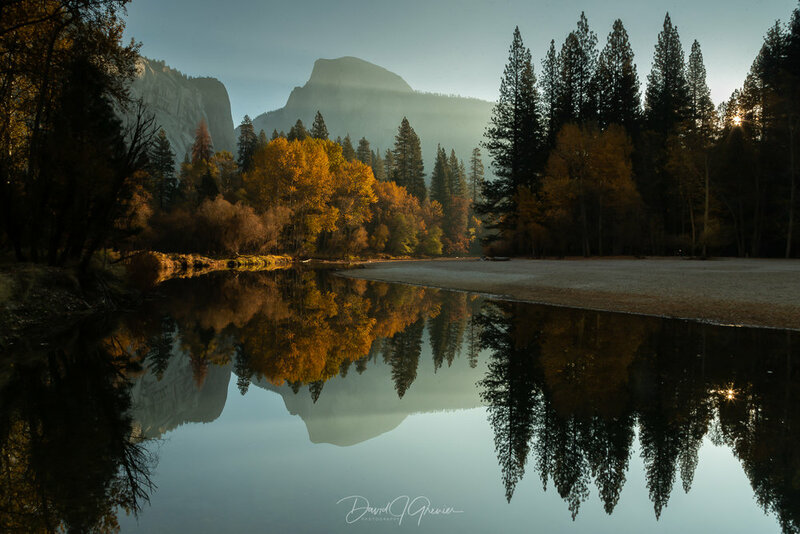 Around this time of the year, mid-November, the fall colors.of these trees are saturated by the early morning light that also seems to add a magical element to the reflection of Half Dome in the perfectly still Merced River. I was here this time with my son Dean J Grenier and his partner Christa Belle, who had never previously visited this magnificent national park. I always feel especially grateful to see this kind of beauty when I am taking special guests to Yosemite so they get to experience the classic and unique majesty that I have discovered and grown to love over the last many years. #5. Jurassic Park Redux – This image was captured on my second trip to the island of Kauai in 2018. I was there to visit my Aussie cousins, Michael and Sharlene Roosmale-Cocq. This is a sunset shot at Kalalau Valley, one of two of my favorite places on Kauai. The other, Ke’e Beach, is still not accessible by road due severe highway damage caused by massive rains that hit the island in April 2017. During the time of this visit we were fortunate to be spared the wrath of Hurricane Lane, although the island was lashed with howling winds and rain for most of our visit. I managed to find this particular location, that I had never shot from previously, and did for the first time because it was the only place I could find to be sheltered from the howling onshore winds prevalent at Kalalau Valley this evening. All’s well that ends well. Mahalo! #4. Higher Ground – This is Moraine Lake again, shot from a high point that gives you a great overview of this magnificent landscape. We were told that it is extremely rare to be able to see and photograph snow here at this time of the year because the inroads to the location are typically closed when snow falls in winter. My 16mm wide angle lens could not capture enough of the grandeur of the landscape so I stitched together 3 separate images to create a panorama that gives a complete view of the lake and its surroundings. #3. Primal Scream – This was one of my first shots of lava entering the ocean around the Kapoho Bay area, Big Island, Hawaii. Getting there and back on the boat that took us out there was challenging, with rough seas and tropical downpours. It was thrilling to see the lava, which is molten rock generated by geothermal energy and expelled through fractures or fissures in planetary crust or in an eruption, usually at temperatures from 1,300°F to 2,300°F (700 to 1,200 °C). There is something primal and prehistoric about seeing lava, and my ride home was very emotional, exaggerated perhaps by getting soaked in a tropical downpour! A few weeks after this memorable experience, an explosion occurred in the same location which hit one of the tour vessels, ripped a hole in its roof and caused severe injuries to some of the people onboard. We felt very fortunate indeed to have been able to experience the thrill of this site and return home unscathed. #2. This Heart of Mine – At the time this image was shot, the Hawaiian Islands braced themselves for the effects of the massive Hurricane Lane that ended up impacting certain areas of the Big Island. We spent our time in a condo right on the beach in a small town on Kauai, named Kapa’a. 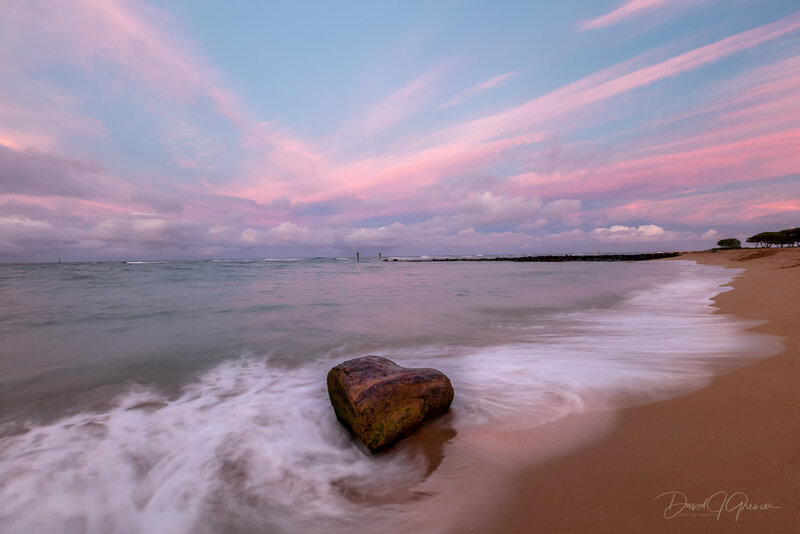 I captured this image on the beach right in front of where we were staying, and got in place to shoot when I began to see color in the sunset sky. Picking the right shutter speed allowed me to smooth the seas and give the sky a little more definition, with the colorful heart shaped rock n the foreground being the icing on the cake! #1. Before The Deluge – This image was captured two days after the one above in the same location. 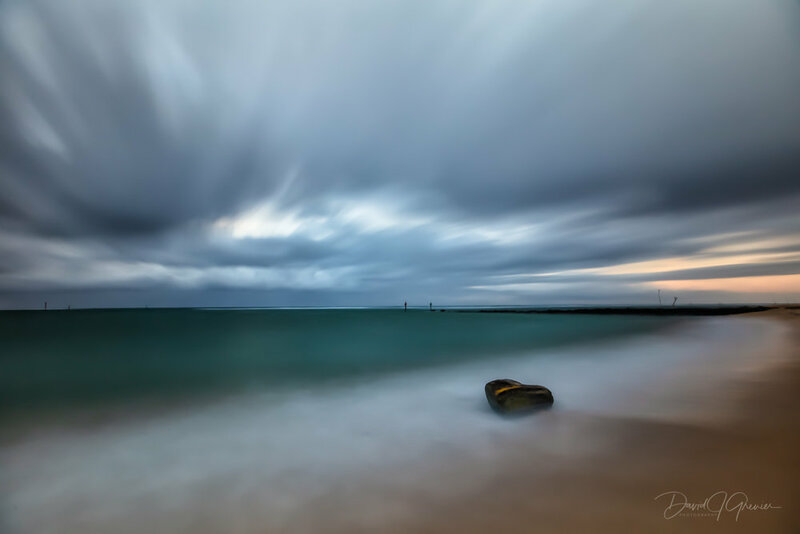 It was a dark and foreboding evening, with strong offshore winds and heavy gray skies but I still wanted to see what I could create in these trying conditions. I was sure that there would be no color for this evening’s sunset so I chose to go to the long exposure using a ten-stop filter. In the end, using the effects of the long exposure I was able to create a sky and ocean that was more photogenic than what actually existed. I have to admit that the heart shaped rock in the foreground was arranged to provide an item of interest, but only realized the significance of it being heart shaped when I downloaded and started reviewing my images. I think it is my favorite image of 2018 and it pleases me that it was also voted #1! And there it is, my sixth annual Top Twelve Photographs for the 2018 year. Also, a continuing tradition, a few observations in closing: 1) The top two images voted on in 2018 were shot in Kauai, 2) four of the top five images were shot in the Hawaiian islands, 3) two images from Yosemite National Park, and 4) two new locations were represented this year – Banff National Park, Canda, and Agra, India. I always feel privileged and fortunate in looking back at the end of each year to see where I have traveled to and the beautiful conditions I was given to photograph and be creative. I’d also like to express a big thank you to all those who expressed their support on my Facebook page, for taking the time to do so – it is greatly appreciated! 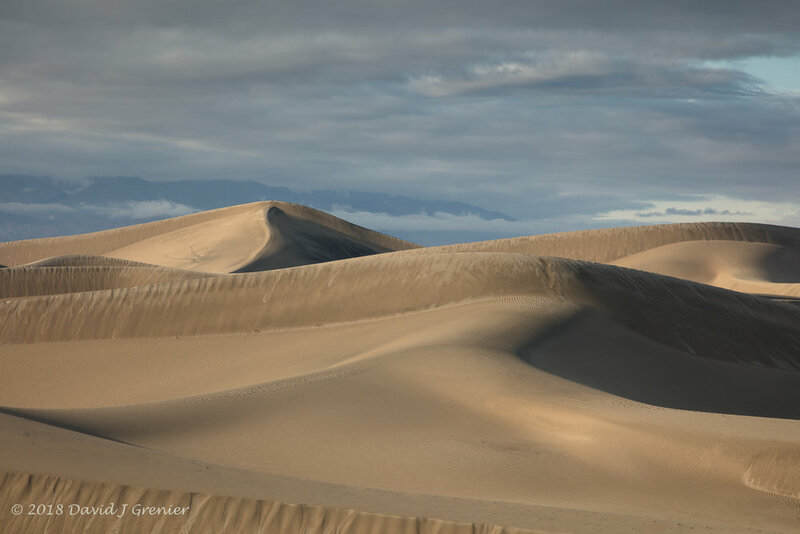 As always, I also owe a great deal of gratitude to the many people who support my photography by purchasing my images in print form, and attending my workshops. Last but not least, the wonderful and talented photographers and friends of mine that I travel and live with during these photographic journeys throughout the year – again, my deepest thanks! Looking forward to 2019 and wishing everybody a wonderful New Year! I have volunteered at the Harris Center for the Arts, in Folsom , California, since the theater opened in 2011. On January 22, 2011, I was an usher for the ‘first’ soft opening event - a complimentary ‘hard hat’ concert for the construction workers, and their families, who had worked on the construction of the theater. SInce that inaugural event I have volunteered close to 1,500 hours as an usher, ticket validator, lobby greeter, etc. and I have been privileged to support the performing arts and see some incredible shows during the last eight plus years. Therefore, it was an honor to be asked by the head of the volunteers to lead a project and organize an art exhibit in the Bank of America Gallery, that is located in the lobby entrance to the theater. The exhibit was a unique opportunity for the artists among the volunteers to showcase their works of art in the Gallery. In order to do so we formed The Friends of the Harris Center Art Association, and 22 other artists stepped forward and volunteered to show their art works. All sales of any art work was then to be donated by each individual artist to the Harris Center. The following is a brief summary of the highlights of the event, in what also turned out to be a first gallery showing of my photography. The local ‘Style Magazine’ very kindly wrote an article in their May edition promoting the exhibit, show below. The above is a copy of the kiosk poster that was designed for the event. The above is a copy of the commemorative poster that was designed by the Harris Center marketing group, and handed out to each individual artist that participated in the inaugural event. The exhibit was a resounding success raising just over a $5,000 donation, contributed by each individual artist through the sale of their artwork items. It was remarked by numerous patron of the theater that ‘this was the highest quality exhibit ever held in the Bank of America Gallery’. I donated 4 metal prints to the exhibit, and was fortunate to have one of images to be chosen as the exhibit’s Best in Show. That print (shown below) was of a holy man that I photographed at the Holi Festival held in Nandgaon, India, and happens to one of my favorite images from the Indian photoshoot I did in March 2018. Before I begin to run down the Top Twelve images for this year, I must say that this one of my most fun, productive, and satisfying years as a photographer. My creative muse is indeed happy for all of the incredible journeys I was fortunate to experience this year. Here is a rundown of locations I photographed in 2017: Yosemite National Park (7 times), Yellowstone National Park, The Grand Tetons, The Palouse, Bishop, Alabama Hills, North Lake, June Lake, Silver Lake, Lundy Lake, Lake Tahoe, Kauai, Maui, Molokai, Monument Valley, Hunts Mesa, San Francisco, The Blue Ridge Parkway, Mabry Mill, VA, Big Sur, and some of my local favorites. First time locations for me were ~ The Palouse, Monument Valley, Hunts Mesa, The Blue Ridge Parkway, Mabry Mill, VA, and the island of Molokai, HI. So, again this year I will count them down starting with Number 12, say something about each image, and provide some basic EXIF data. #12 ‘Napali Kona Sunset’ ~ this is the magnificent Kalalau Valley at sunset, from the Na Pali Kona Forest Reserve along the Pihea Trail, our first day out shooting in the Waimea Canyon region of Kauai. I had been here many times in previous years but had never seen this canyon lit up like this before. I am happy that this image made the Top Twelve this year as this was my first professional photo shoot! I was hired by a well know San Francisco marketing agency, and the Creative Director of this 9-day shoot in Kauai was a person that I have known for thirty eight plus years, my daughter Michelle. One of the best father-daughter experiences of my life, we were fortunate to have great weather all the way. This location is truly, one of the most beautiful sites in the world! #11. 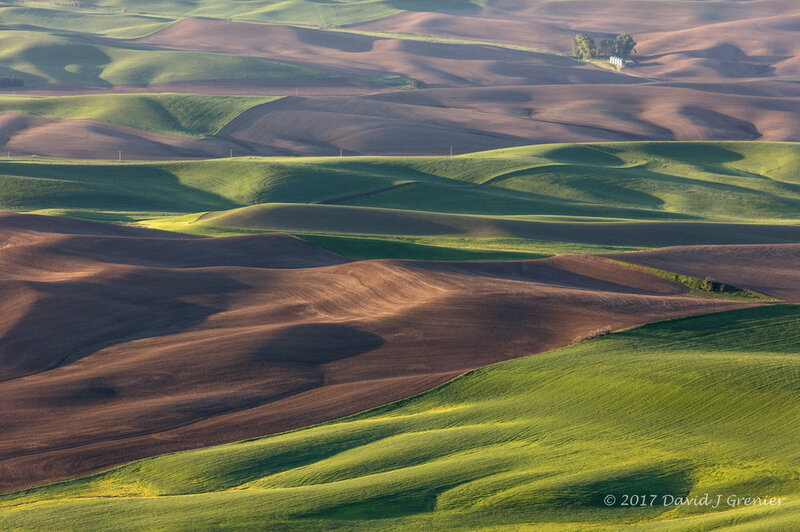 'Waves of Wheat' ~ an image from a sunrise shoot at the summit of Steptoe Butte, the Palouse, a region east of the Cascade Mountains, where SE Washington meets Idaho. 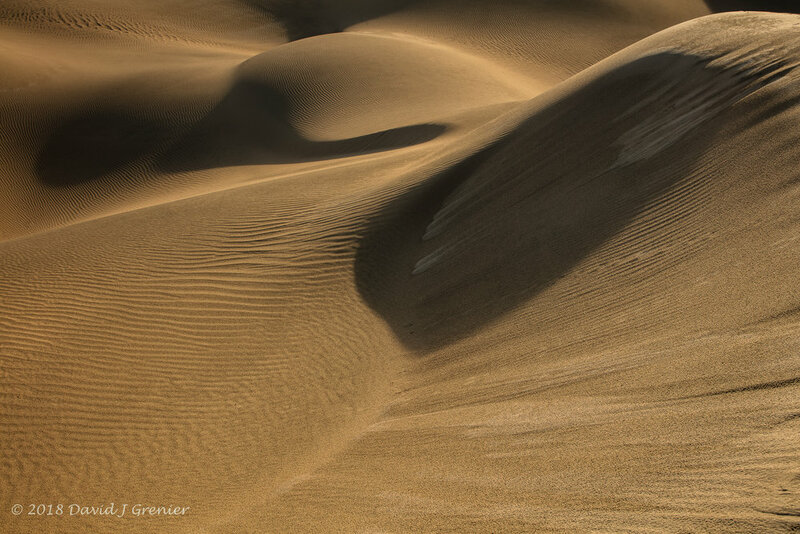 This was my first visit to this area, described by one of the local farmers as 'earth dunes', which struck me as being an interesting take of this region. The rich farmlands of rolling hills are blanketed with a patchwork of colors, that are lit up beautifully by the low morning light. I have never seen anything like this before, and the beauty and compositions were endless! #10. 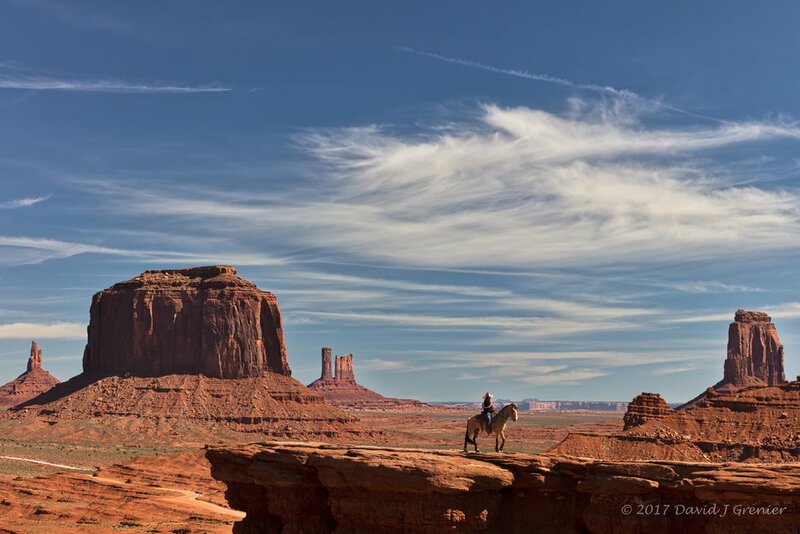 'Blowing in the Wind' ~ one of the last images from a fabulous Arizona Highways Photo Workshop in Monument Valley, led by one of the most knowledgeable, talented Navahoe, and award-winning photographers, LeRoy DeJolie. This was our last morning's sunrise, and I added interest to the sky with a 121 second exposure utilizing a 10 stop neutral density filter. This was one of the most enjoyable and spiritual workshops I have had the privilege of attending, especially the time we spent at Hunts Mesa. #9. 'As the Wheel Turns' ~ When Edwin Boston Mabry (1867-1936) built his water powered mill in Virginia’s Blue Ridge Mountains, he had no way of knowing it would become one of the most photographed places in the United States. The mill, on the Blue Ridge Parkway at milepost 176.1, draws several hundred thousand visitors each year. The gristmill and sawmill have been restored by park naturalists so visitors might see live exhibits, a real mill, and a working miller to demonstrate the milling process. This was another one of my first-time-visit locations this year, and hope to return again to enjoy the fall colors and tranquility of this unique area again! #8. 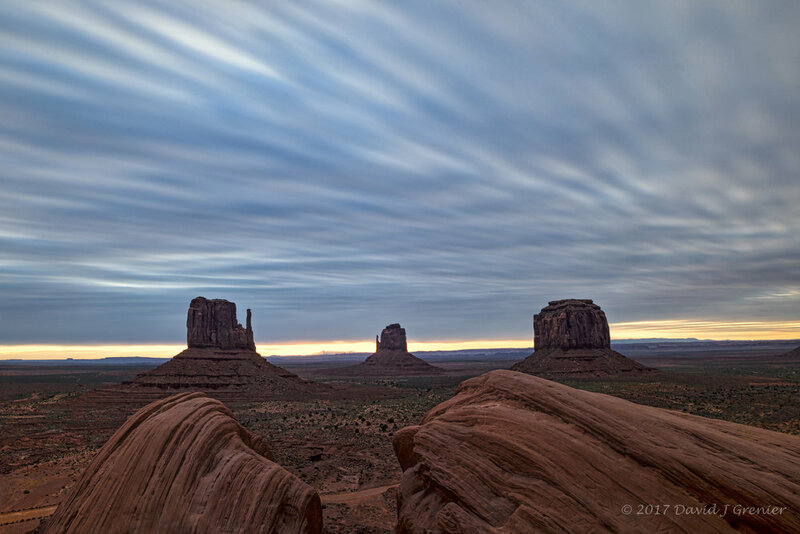 'Hunts Mesa Morning Light' - one final image from my Monument Valley, AZ, photoshoot. 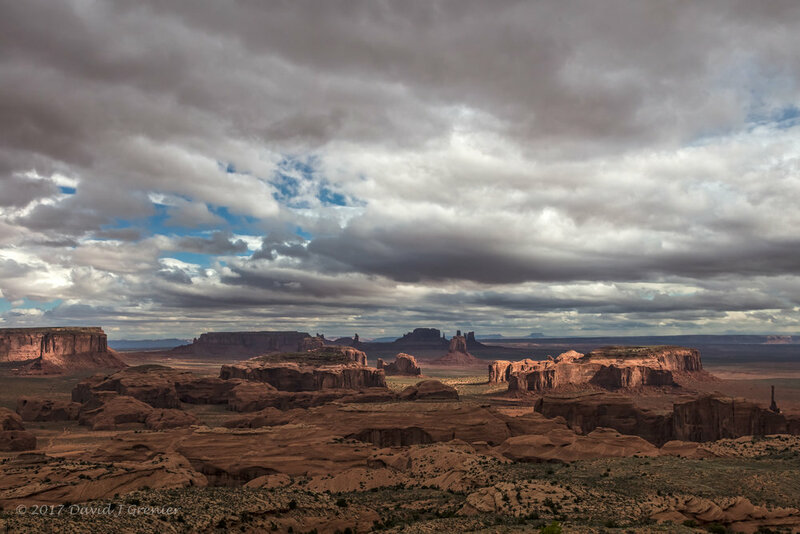 This is the view of Monument Valley from Hunts Mesa, the morning after we camped out that night. The spirituality and beauty of this place is palpable and special. It was made especially so by the spiritual ceremony performed by LeRoy DeJolie when we first arrived. I will always remember this place, for the views, the way I felt, and the bitter cold winds on the night that we camped out. Also, it will be difficult to forget the journey out here, in huge four-wheel vehicles that were driven on a barely visible trail, that in places was driving on and through massive sandstone rocks! #7. ‘Yosemite Falls Reflection’ ~ I drove into Yosemite National Park on Friday, February 11, 2017, through one of the heaviest rainstorms I have ever experienced in this area. I shot this image by the parking lot just to the left after you cross over Sentinel Bridge. The temporary standing water in Cook’s Meadow provided a unique opportunity for a refection shot of Yosemite Falls, including a small rainbow that appeared briefly at Mid Falls. 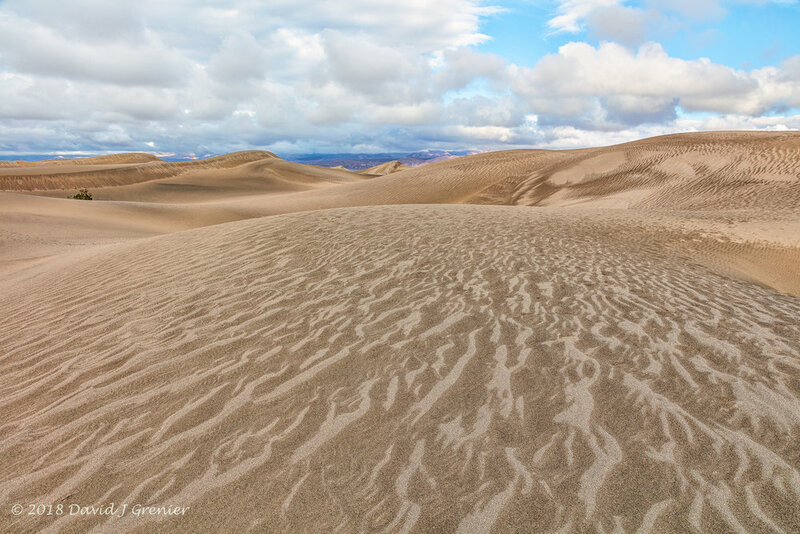 California experienced on of the most prolific years of precipitation in 2017, that helped bring to an end a seven year drought that had a profound impact on the State. Because of the huge rainfalls, Yosemite was a wash with standing water not seen in any normal year, and provided photogrpahic opportunites for reflections in areas that again, I had never seen before in Yosemite Valley. #6. 'Spotlight' ~ captured this Three Brothers reflection on a still Merced River, Yosemite National Park, during my seventh and last trip to Yosemite late 2017. Fall is a great time to be in Yosemite for reflection shots, and I was fortunate to get a sky to go along with a still day. 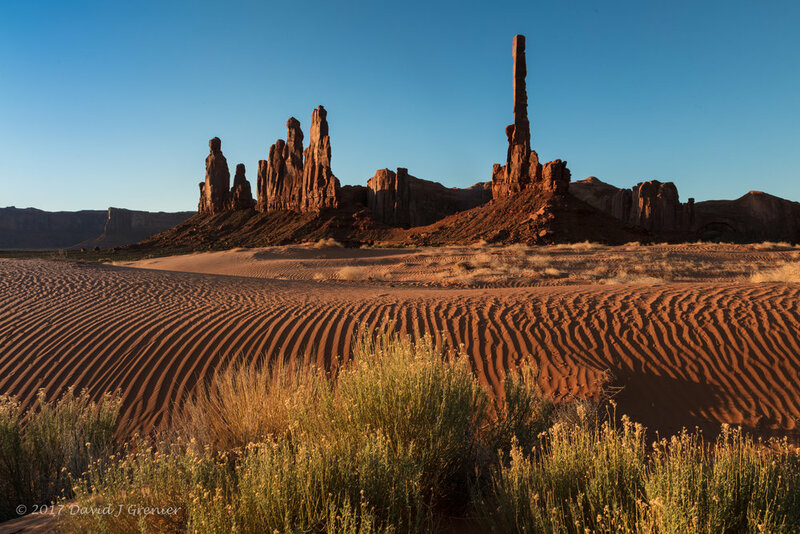 Shot this image from a perfect location to capture reflections of this iconic granite formation. A couple of hours earlier, the sky was perfectly clear, and I began the day by shooting image #3. Then conditions chanh=ged quickly, as they do in Yosemite, creating a ominous looking sky that was perfectly for this composition! #5. 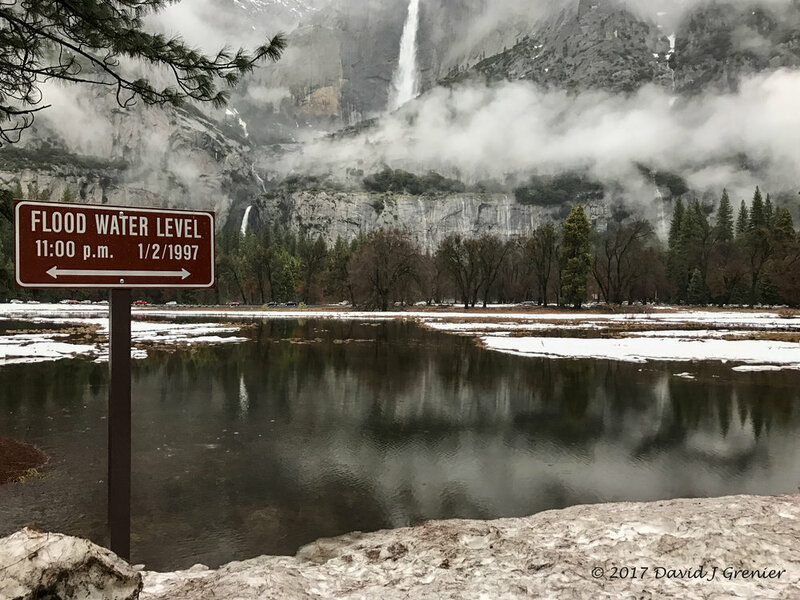 ‘Before the Deluge’ ~ I drove down to Yosemite National Park the first week of January to find very heavy, warm rains falling, thereby removing all of the fallen snow off the Valley trees. This was shot during about an hour's break in the storm on Thursday, with the mist caused by the abundant water, adding a lot of character to this beautiful Valley. NorCal had been under a deluge of rain/snow earlier that week, and a series of storms over the last few weeks in the Sierra Nevada have been very good to Lake Tahoe. According to the National Weather Service, the lake has gained about 33.6 billion gallons of water since Jan. 1, and the lake has risen about one foot in 5 days! #3. Etched in Light ~ I have learned as a photographer, that ‘being there’ has a great deal to do with getting a great shot. However, when you are there ‘knowing where you need to be’ allows you to get the exceptional shot. I began this morning at Tunnel View with clear, bald blue skies. From experience, I knew that this particular spot on the Merced River could be really good, as early morning could highlight the fall colors at the river bend. I guessed right! I was the only person here on this special morning, November 2, 2017, and came away with my favorite image of my Yosemite fall shoot. #2. ‘Serrano Oak Sunset' ~ ‘Perhaps the crescent moon smiles in doubt at being told that it is a fragment awaiting perfection. ~ Rabindranath Tagore. 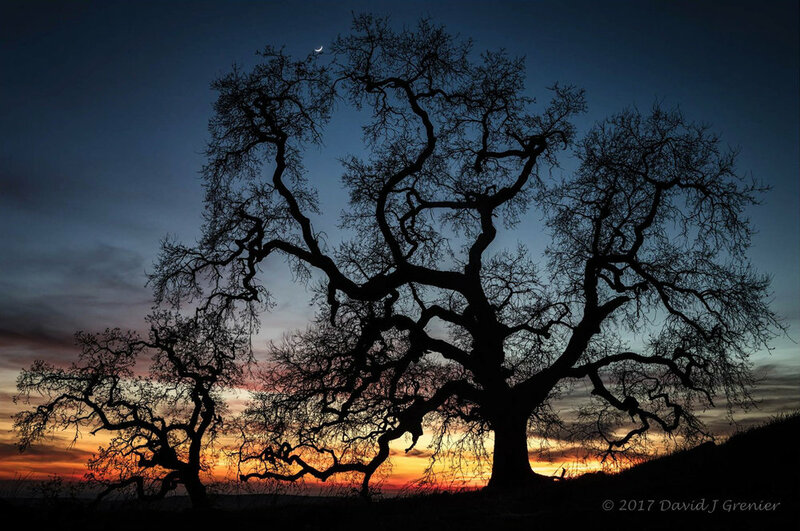 The rain storms were taking a temporary break in NorCal, which gave us this beautiful sunset and crescent moon last night, at my favorite oak tree a two minute drive from my home. It is aways special and rewarding, after traveling to many faraway places on this planet, that an image shot a few minutes away from where I live, ends up in the Top Twelve Photographs of any year! #1. ‘Majestic’ ~ one of my favorite locations in Yosemite National Park, a place that I refer to as River Bend, that has this magnificent view of Half Dome and the Merced River. Sunset on a Saturday night, March 4, 2017, provided these beautiful colors, and with a slow shutter speed I was able to smooth out the river waters and pick up more of the reflection colors. The eddies and swirls added that needed interest to the foreground, all adding up to this image being voted #1 in 2017! And there you have it, my fifth annual Top 12 Photographs for the 2017 year. Also, a continuing tradition, a few observations in closing - 1. Five of the Top Twelve images voted on in 2017 were shot in Yosemite National Park, a very special place on Earth for me, both spiritually and photographically, 2. five of the twelve were shot in first-time locations for me - Monument Valley, Hunts Mesa, AZ, Mabry Mill, VA, and the Palouse, WA. It is always interesting for me to compile these images every year and be reminded of the wonderful accomplishments I was privileged to complete by traveling to these beautiful locations, as well as what excellent tastes that the followers of my Facebook page have. The Likes and Comments each image receives are the basis of determining what appears in this Top Twelve list each year. So a big thank you to all these people for taking the time to do so - greatly appreciated! In conclusion, and as always, I owe a great deal of gratitude to the many people who support my photography by purchasing my images in print form, attend my workshops, as well as the hundreds of Likes and Comments that so many people take the time to stop by and leave on my Facebook page at http://facebook.com/djgrenier . Last but not least, the wonderful and talented photographers and friends of mine that I travel and live with during these photographic journeys through out the year - again, my deepest thanks! Looking forward to 2018 and wishing everybody a Wonderful New Year! In all the time we spent in Patagonia, both Argentina and Chile, we had very strong winds blow. 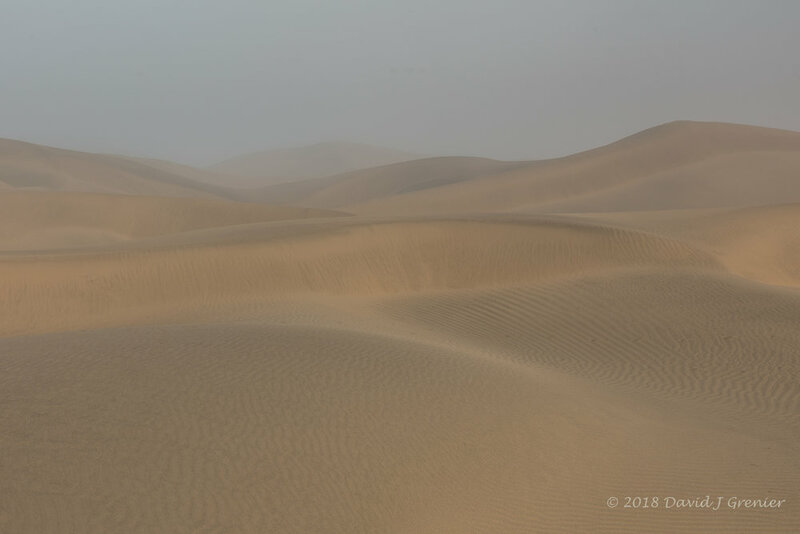 While these are the prevailing winds in the region, as a photographer a goal of this trip was to capture reflection shots of the magnificent local mountain ranges - Mt. Fitzroy in Argentina and Paine Massif, located in Torres del Paine National Park, Chile. On this particular morning, while I knew the chances were low, I wanted to walk to a lake located at the bottom of these beautiful distinctive three granite peaks of the Paine mountain range or, Paine Massif. With two other photographers in tow, we set out to walk to the lake. It was a long walk, begun in the dark and we kept walking until day light first appeared. After a lengthy walk it became obvious that there was no still water anywhere. We reached the lake, confirmed that there was no reflection shot and began walking back. The next composition I was contemplating in my mind was the early morning light that I knew was about to hit these granite peaks. In the foreground I also knew that I had to use the omnipresent dead, silver colored trees, still standing from accidental fires that ravaged the park at various times going back to 1985. I captured another image before this one, did not like the composition and quickly scrambled into a place that I could also include the path. Back at the hotel later that day I developed this image and was very happy with how it turned out! Today’s Photo Of The Day is “Patagonia Morning Light” by David Grenier. Location: Torres del Paine National Park, Chile. I was fortunate to have traveled and created opportunities to shoot in a wide variety of places in 2016. From my favorite venues such as Yosemite National Park, Mono Lake, Bodie Historical State Park, and the Central Coast in California, this year I was also able to shoot for the first time along the Pacific North West Coastline in Oregon. There were a number of other memorable firsts for me this year ~ The Grand Teton's National Park, Yellowstone National Park, and last but not least and a highlight of the year was a visit to the Patagonia regions of Argentina and Chile. It was also my first visit to the Continent of South America, and adds to my list of Continents that I have already visited - Asia, Australia, Africa, Europe and North America. That makes it 6 of the generally recognized 7 Continents, with the outstanding 7th now being Antartica. I wish I could tell you that I have in an interest in making it to all 7, but I have no interest as of this writing to do so since cold weather to this day chills me to the bone! So again this year I will count them down starting with Number 12, give you the Facebook vote count, say something about each image, and provide some basic EXIF data. #12 (112) 'In the Footsteps' ~ Some fall colors in the foreground and the Grand Tetons basked in afternoon light, shot from the Snake River Landing parking lot in the Grand Tetons National Park, Wyoming. This was the location that Ansel Adams shot one of his iconic black and white images, perhaps one of his most famous, entitled The Tetons and the Snake River, in 1942. Back then the Snake River bend created a beautiful leading line into the Tetons, where as now those trees have grown upwards a great deal and the shot is quite different, but still beautiful, especially with the fall colors. Adams was passionate about the natural landscape in which he spent much of his childhood, and would use his art to convince, or remind, others of it's beauty. Still a worthwhile pursuit for any photographer even today! #11 (115) 'Light My Fire' ~ This is what is commonly known as the 'Horsetail Falls phenomenon'. What you see in the image below is Horsetail Falls light up by the setting suns' light shining on the water that flows down this particular location for a few weeks in February in Yosemite National Park. It is one of nature’s most wondrous sites to watch how this phenomenon gradually develops high on top of the eastern side of El Capitan, where I am certain thousands of people drive by and do not even know that this waterfall exists! For this amazing site to occur, water needs to be present in the falls, the sunset needs to unobstructed by clouds in the western sky, which then lights up the falls and its spray to look like it's on fire within the last few minutes of the setting sun. I have had the good fortune of being here three times over the last many years to view and photograph it, and this last time was simply the best! #10 (116) 'Lady in Red'~ Alpenglow at sunset reflected in the Merced River, at Valley View, or also know as Gates of the Valley, Yosemite National Park, California. El Capitan (Spanish for The Captain) is located on the north side of Yosemite Valley, near its western end, the granite monolith extends about 3,000 feet (900 m) from base to summit along its tallest face and is one of the world's favorite challenges for rock climbers and BASE jumpers. Along with most of the other rock formations of Yosemite Valley, El Capitan was carved by glacial action. This is one of my favorite locations to shoot at sunset when the skies are completely devoid of clouds, and the alpenglow can be counted upon to give a photographer this beautiful reflection photographic opportunity! #9 (120) 'Tranquil Solitude' ~ I have shot this lone oak tree from this particular location, a ten minute drive from my home, so often that it has now unofficially been named My Oak Tree! Over the years I have been fortunate to shoot many an image here, always blessed with amazing skies that light up at sunset. This particular image shows a typical winter's evening in Northern California, a place I have called home now for almost 14 years, when the hills begin to turn green again, a chill is in the air, and we are blessed with these beautiful skies. I love this spot because it allows me to be creative between photo shoots to exotic, far away locations, and enjoy this pastoral scene a few minutes from the hustle and bustle of city life. I also don't take if for granted that one day this location will become a massive construction site for the continuous urban sprawl that we have become accustomed to and put it down as 'the progress of man'! #8 (122) ‘Homeward Bound’ ~ “The fact that we live at the bottom of a deep gravity well, on the surface of a gas covered planet going around a nuclear fireball 90 million miles away and think this to be normal is obviously some indication of how skewed our perspective tends to be.” – Douglas Adams. It had been a desire of mine for several years to capture the Milky Way arch, and I finally did so at South Tufa, Mono Lake, June 2, 2016! For a technical point of view, this is 7 different images taken with my camera on a tripod, beginning at the left side of the Milky Way and then rotating the camera and shooting another image several times. I then 'merge' the resultant 7 images in a function of Adobe Photoshop, creating a final image that looks like the one below. Some fun facts about The Milky Way - the Galaxy measures some 100,000–120,000 light-years in diameter, it is home to planet Earth, the birthplace of our humanity. Our Solar System resides roughly 27,000 light-years away from the Galactic Center (far right). The Milky Way has between 100-400 billion stars; but when you look up into the night sky, the most you can see from any one point on the globe is about 2,500, which on a new moon night and the accompanying dark skies, and a mere mortal like me looks up at the sky, I would swear that I was looking at all 400 billion stars in the galaxy! It is overwhelming, humbling and I strongly recommend that you experience this at least once in your lifetime! #7 (138) 'Shine On You Crazy Diamond ~ Closed out 2016 with this image, shot during a couple of days that I spent with my son in the Big Sur area mid-December. This is Keyhole Arch, Pfeiffer Beach, Big Sur, California, and the phenomenon that occurs annually during the time of the Winter Solstice. The best light for this happens mid-December to mid-January, when the setting sun shines through the Keyhole, provided there is a cloudless sky on the western horizon at sunset. I always find this to be such a fun shoot. You must arrive early as the parking lot at Pfeiffer Beach, privately managed, is small and fills up quickly. The beach is crowded with lots of families and photographers. It is not difficult to get a spot to shoot from as most photographers move around as the setting sun moves around and gives you different looks as it pours in through the Keyhole. I leave you with this thought for the New Year ~ ‘We must accept finite disappointment, but never lose infinite hope.’ ~ Martin Luther King, Jr.
#6 (144) ‘Mountain Light’ ~ One of my favorite images from the Patagonia trip, shot at sunrise on a cloudy morning, with the magnificent, and distinctive three granite peaks of the Paine mountain range or Paine Massif. The Torre del Paine National Park, encompasses numerous mountains, glaciers, lakes, and rivers in southern Chilean Patagonia. In the foreground are the omnipresent dead, silver colored trees, still standing from accidental fires that ravaged the park at various times going back to 1985. To me this was one of the highlights of our Patagonia photo shoot, as the scenery and the views of this magnificent mountain range on this particular morning was simply spectacular. The early morning light was special and the hundreds upon hundreds of dead, silver colored, gnarly trees added a great deal to the setting, providing ample foreground material to make any composition interesting. #4 (182) 'Stuck in the Middle' ~ The waterfalls, streams and rivers in and around Yosemite Valley typically have an abundance of water flowing in spring time, a result of the winter's snow beginning to melt and the run off begins. 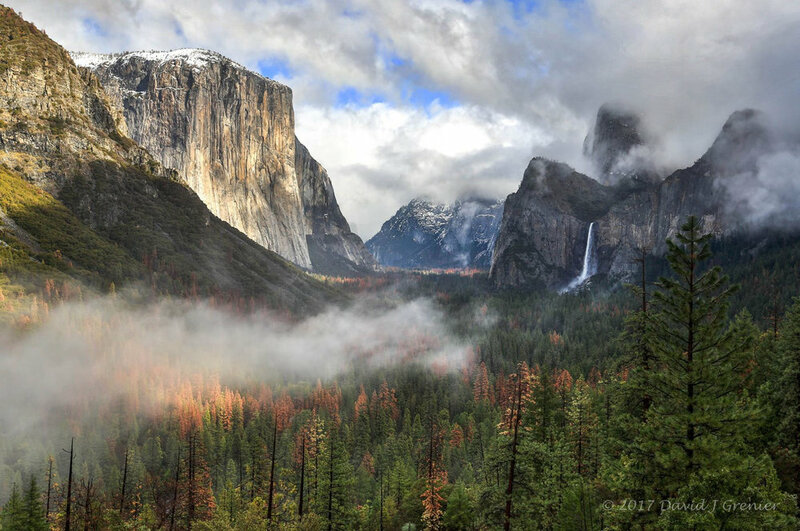 It is a wonderful time of the year to visit Yosemite. This is an image that I shot, precariously hanging off the edge of the bridge over Cascade Creek in early March. The lone tree growing, seemingly out the middle of these two rocks caught my eye, and I wanted to capture the chaos of the raging waters around the stillness of the rocks, with the lone, bare tree stuck n the middle. I tried a number of camera setting and settled for this one, trying to freeze the movement of the water and show a sense of the turbulence and power of the rushing water juxtaposed against the stillness that these two rocks provide with the lone tree growing in the middle of this natures chaos. #3 (258) 'Peaceful Easy Feeling' ~ This is one of my favorite locations to visit, just hangout, and photograph in Yosemite National Park. It has many names - River Bend, Housekeeping Bend, as well as Camp 4. It provides a wonderful view of the magnificent Half Dome, with many different faces, colors and features dictated by what happens in the various seasons in Yosemite. This was shot February 18, a day after a snow storm swept thorough the area, when I was in the Valley intent on shooting the Horsetail Falls phenomenon that can occurs about this time every year. The title of this image derives from what I feel every time I stand at this location in Yosemite National Park, with the Merced River in the foreground and the magnificent Half Dome in the background. I have many a fond memory of this location in just about every season, and always look forward to visiting it every time I am fortunate to be in the Park. #2 (261) 'Perfectly Still' ~ This is one of my favorite images from my trip to Patagonia in the latter part of the year. I had never been anywhere before in South America, but always wanted to visit the Patagonia region, that encompasses parts of Argentina, as well as Chile. This was shot in Torre del Paine, Chile, with the Cuernos del Paine and Almirante Nieto mounts reflected in Lake Pehoé at sunset. Patagonia is famous for its prevailing winds, so strong that a gust can knock you down to the ground and often. That is not conducive to reflections, to say the least. So two quotes come to mind about this image - ‘Creativity is intelligence having fun’ ~ Albert Einstein, and ‘You don’t take a photograph, you make it’ ~ Ansel Adams. It took an unusual effort for me to make this image, but I also had a lot of fun doing so! #1 (323) 'Both Sides, Now' ~ The early spring months in Yosemite National Park are a great time to photograph reflections in the Valley. It is a time before the snow that accumulates during the winter months begins to melt and eventually begins rushing down the various waterfalls that end up in the Merced River. This image was captured the day after a small snow storm passed through Yosemite, creating these beautiful clouds around the dawn wall of this iconic land marks in the Valley. 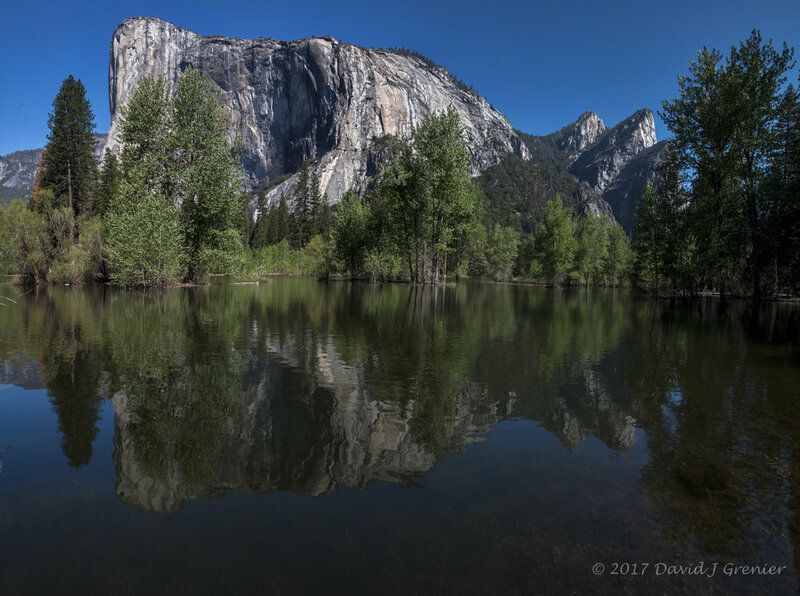 I shot this from one of my favorite locations to view the magnificent El Capitan, and its reflection in a very still Merced River (with the aid of a polarizer). I dedicated this to one of my all time favorite singer songwriters, Joni Mitchell, who is recovering from a brain aneurism suffered early last year. Get well Joni, your songs are very much a soundtrack of my youth, wishing you a full and speedy recovery! And there you have it, my fourth annual Top 12 Photographs for the 2016 year. Also, a continuing tradition, a few observations in closing - 1. Six of the Top Twelve images voted on in 2016 were shot in Yosemite National Park (a first), my own Granite Cathedral, where I go to converse with God:), 2. nine of the twelve were shot in California, (another first), 3. two were from Patagonia, Chile, 4. the remaining one of the twelve was shot in Wyoming, and 5. five of the images were vertical compositions (another first). It is interesting for me to compile these images every year and be reminded of the wonderful accomplishment I was privileged to be allowed to complete by traveling to these beautiful locations, as well as what excellent tastes that the followers of my Facebook page have, and how much these people help in my selection process at the end of each year. So a big thank you to all these people for taking the time to do so - greatly appreciated! In conclusion, and as always, I owe a great deal of gratitude to the many people who support my photography by purchasing my images in print form, as well as the hundreds of Likes and Comments that so many people take the time to stop by and leave on my Facebook page at http://facebook.com/djgrenier Last but not least, the wonderful and talented photographers and friends of mine that I travel and live with during these photographic journeys through out the year - again, my deepest thanks! Looking forward to 2017 and wishing everybody a Wonderful New Year!